The federal government handed a victory Sunday to the tribe and its supporters fighting the Dakota Access Pipeline, announcing it would deny the permit needed to complete the project. The Army Corps of Engineers said it will instead launch a more thorough review of the oil pipeline, considering alternate routes. The 1,200-mile line was slated to cross under the Missouri River in North Dakota next to the Standing Rock Sioux Reservation. “The Standing Rock Sioux Tribe and all of Indian Country will forever be grateful to the Obama Administration for this historic decision,” Standing Rock Chairman Dave Archambault said in a statement. The tribe sued the Corps this summer trying to stop the pipeline, concerned that a potential spill would contaminate its drinking water downstream. A federal judge denied the tribe’s request for an injunction to halt construction. The tribe appealed, but that request was also rejected by a panel of judges. Interior Secretary Sally Jewell praised the “thoughtful approach” taken by the Corps. “The Army’s announcement underscores that tribal rights reserved in treaties and federal law, as well as Nation-to-Nation consultation with tribal leaders, are essential components of the analysis to be undertaken in the environmental impact statement going forward,” she said. While the thousands of people camped along the snowy banks of the Missouri River in solidarity with the tribe cheered upon learning the news Sunday, the future of the pipeline remains unclear as the Corps begins the process of the more thorough review, known as an environmental impact statement. The Corps promised “full public input and analysis” while it considers routes other than the one slated to cross under the river next to the reservation. The Corps did not offer a timeline for when the review will be finished or where the other routes might go. 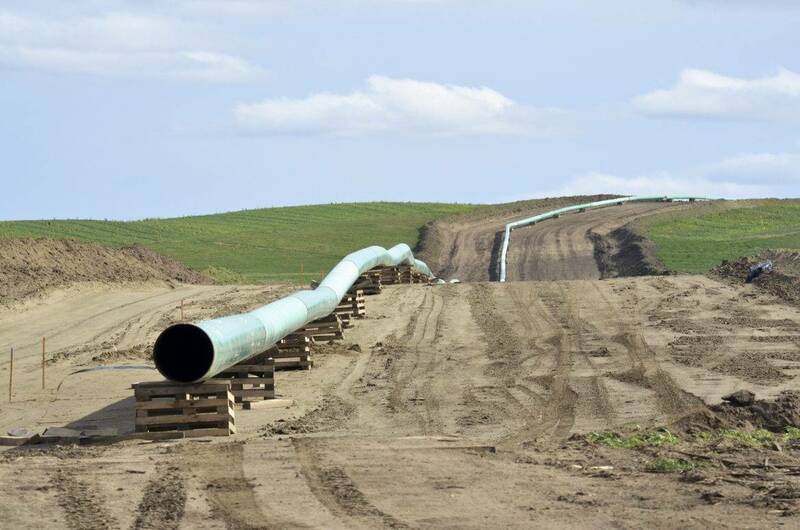 The Midwest Alliance for Infrastructure Now — a coalition of energy, labor and other groups that support the Dakota Access Pipeline — suggested the fight for the pipeline’s continued construction may not be over. “With President-elect Trump set to take office in just a few weeks, we are hopeful that this is not the final word on the Dakota Access Pipeline,” said Craig Stevens, a spokesperson for the coalition. The pipeline is already nearly complete, with hundreds of miles of pipe buried underground. The project crosses four states from the Bakken oil fields, through the Dakotas and Iowa to Illinois. Construction has remained halted for months at its Missouri River crossing near the Standing Rock reservation while the Corps delayed making a decision on whether to grant the easement needed to connect the pipe laid on either side of the river. The Corps concluded last month that it met legal requirements in permitting the pipeline but sought more input from the Standing Rock tribe. “It does nothing to resolve the issue, and worst of all it prolongs the serious problems faced by North Dakota law enforcement as they try to maintain public safety,” he said. The state of North Dakota has authorized $17 million over the past four months to respond to demonstrators who oppose the pipeline. Thousands of protesters have camped on the prairie near pipeline construction for months, staging demonstrations from work areas to the state Capitol an hour north. Police officers have made more than 500 arrests, as they say protesters trespassed, engaged in riots and vandalized equipment, among other criminal acts. Protest leaders have decried what they consider militarized tactics on the part of police. Law enforcement has used pepper spray, non-lethal bullets, tear gas and water hoses to contain crowds. Organizers of the protest maintain that demonstrators are unarmed. But to the pipeline’s supporters, the Corps’s announcement ushered in disappointment. Cramer criticized President Barack Obama for making the pipeline decision on his way out of the office. Obama said in an interview with Now This News last month that he wanted to look at options to re-route the project, though it wasn’t until Sunday that the Corps announced that was its plan. “I’m encouraged we will restore law and order next month when we get a President who will not thumb his nose at the rule of law,” Cramer said.